In medium bowl, mix matzo meal, paprika, mustard, salt and pepper. 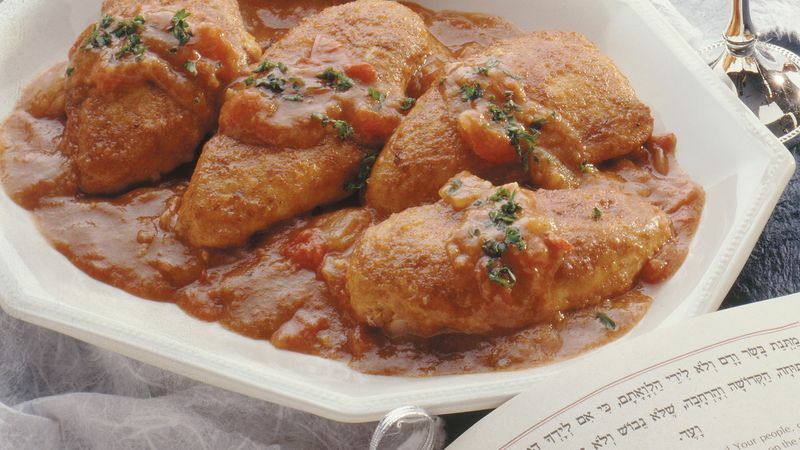 Evenly coat chicken with matzo meal mixture, reserving any remaining mixture. In 10-inch nonstick skillet, heat 3 teaspoons oil over medium heat until hot. Add chicken; cook 1 to 2 minutes on each side or until lightly browned. Remove chicken from skillet; keep warm. In same skillet, heat remaining 1 teaspoon oil. Add onion and garlic; cook about 5 minutes, stirring occasionally, until onion is tender. Stir in broth, wine and reserved matzo mixture. Return chicken to skillet. Heat to boiling; reduce heat. Cover; simmer 7 to 9 minutes or until juice of chicken is clear when center of thickest part is cut (170°F). Stir in tomato. Cover; cook 2 to 3 minutes or until heated. Garnish with parsley. Serving more than four? This recipe doubles easily, so you can feed extra friends and family.